Sarah Ruhl is having a moment. 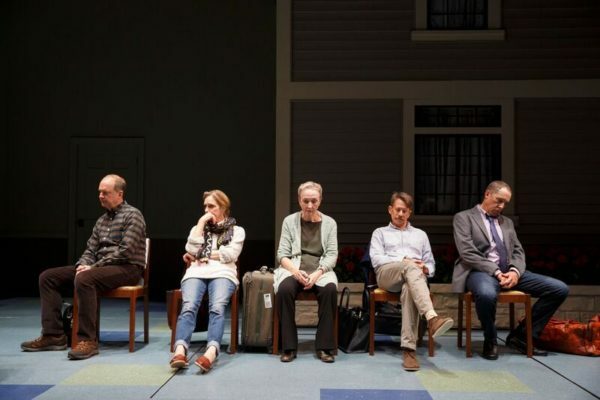 How to Transcend a Happy Marriage, at Lincoln Center last spring, was a deconstruction of white marital unrest, an actually transcendent, cracked Fabergé egg that rose above its sitcom stylings to expose the Weltschmerz at the heart of suburban ennui. For Peter Pan on her 70th birthday, at Playwrights Horizons, is Ruhl’s second premiere of 2017. If it ultimately proves the rare miss for her, it continues the playful formal experimentation that has made her one of the most important American playwrights working today. Even her misfires are noteworthy. For Peter Pan draws from a number of cultural allusions. The most important, of course, is the eponymous flying boy. The aged Ann (Kathleen Chalfant) opens the play by stepping in front of the curtain to address the audience. She played Peter Pan at the Davenport, Iowa Children’s Theater in 1955, and once even met Mary Martin. Unlike The Boy Who Wouldn’t Grow Up, though, Ann inevitably did, and now that she’s pushing 70, everyone around her is beginning to die as well. The play’s most striking moment, in fact, is when Ann’s bucolic monologue ends and the curtain parts to reveal her jaundiced father (Ron Crawford) in his death throes. This segment, the first of three in the play, shows Ann, her sister Wendy, and her three doctor brothers, John, Jim, and Michael (names are important here), holding vigil over their father’s final moments. “Dying is easy, young man, living is harder,” George Washington says in Hamilton. Clearly, he never saw this play. The only sound for much of the scene is the implacable beep of the heart monitor; occasional moments of levity and bonding are curtailed by the father’s death rattles. The siblings are intentionally indistinguishable—Ruhl is more interested in the sound of the crowd than the individuals who make it—and the setting bleak and hyper-realistic. Realism is an uncommon mode for Ruhl, whose default setting is poetic prestidigitation. From Eurydice’s raining elevator and talking stones to the therianthropy of How to Transcend a Happy Marriage, the worlds Ruhl creates are often punctuated by fairy-tale flourishes just a couple degrees left of reality. It’s an everyday magic that belies a warm, compassionate worldview. A bit of that wonder seeps into the second scenario, which finds the siblings at their childhood home, now haunted by the ghost of their father, who was also a doctor, and their old dog. The earthly and mystical planes interact amusingly as the siblings wonder if there’s life after death, but the play’s seams also begin to show as conversations devolve into arguments over politics and religion. Ruhl’s dramaturgy has always been a rejoinder to traditional conflict-heavy Western playwriting: light on event, but pulsating with the force of her ideas and imagination. Here, though, the drama has been eliminated altogether. Argument stands in for conflict; the idea, not the play, is the thing. In the past, she has made her characters’ conversation perfunctory and superficial to expose the mechanisms they use to mask terror and insecurity. Having foregone individuation, however, For Peter Pan feels more like a Sarah Ruhl parody than a Sarah Ruhl play. A couple examples: “I wonder if the whole country grew up after JFK was shot.” “Either that or the whole country decided never to grow up after JFK was shot.” And, later: “If this family, who loves each other about as much as a family can, can’t talk about politics in a civilized fashion, how do you expect the rest of the country to talk to each other at all?” This attempt to read the state of the nation is a welcome step toward making the Ruhl-iverse less insular and hermetic, but the play floats along on the surface, safe and sane and totally harmless. Rebecca Taichman’s intuitive direction of How to Transcend a Happy Marriage fleshes out Ruhl’s thin characterization by foregrounding the play’s subtextual dominant/submissive dynamic. Here, director Les Waters lets the text do all the heavy lifting, and the specter of death that the first scene raises is quickly forgotten. The staging and delivery choices are mechanical and workaday, leaving the fine ensemble, which includes Daniel Jenkins, Keith Reddin, David Chandler, and Lisa Emery, to flounder. Kathleen Chalfant, no stranger to plays about death and dying (having starred in both Angels in America and Wit), does what she can to animate a role that is all brain, no body. The usual playfulness is there, then, but perhaps, this once, Ruhl is too close to her material. The play is intended as an homage to her own extended Iowa family. Ann is, in many ways, a carbon copy of Ruhl’s mother, Kathleen, who played the role in Chicago. This is one of the great dangers of writing about real people, especially loved ones: the impulse to avoid giving offense can drain the play of life and alienate anyone not in the know. It’s undoubtedly a gift to the people who fashioned Ruhl, and a sincere love letter to the theatre, where, as Ann says at the end, “you don’t have to grow up.” Perhaps, but that doesn’t mean there’s room for everyone in the nursery.